WELCOME TO THE WORLD’S LARGEST FOOD FIGHT! 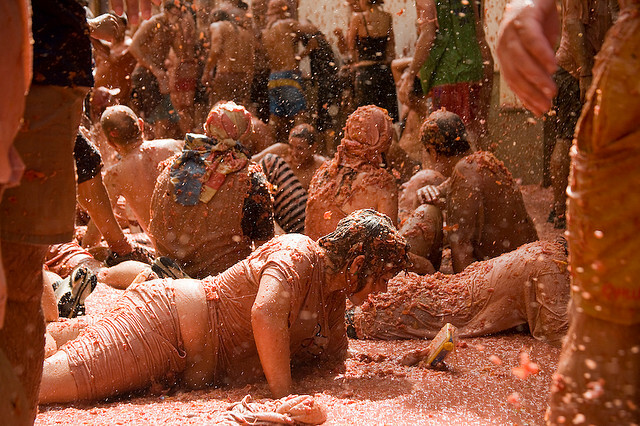 If you are thinking of heading to the village of Buñol, near Valencia, for this year’s tomato-throwing La Tomatina Festival, be warned that you now need a ticket to take part! This entry was tagged culture, customs, Europe, fiestas, Food, life, lifestyle, photography, Spain, travel. Bookmark the permalink. Yeah – a sponsored tomato throw!! Great idea! Shame for the many people who will turn up without tickets and wont be able to get in. Thought I’d try to do my bit to let them know! It IS crazy, Cathy – I wonder who ever thought of it in the first place?!! Me too! I was surprised in Spain and Portugal how many creative ideas there were!! 🙂 Are you attending? Marianne, when I read your questionI couldn’t help answer, because I love to find out about the origins of Spanish customs and fiestas I happen to have found out a little bit about La Tomatina. I had always though it must have originated as a fun way of using up old tomatoes which were too ripe to sell! Nothing so rustic! Apparently it all started in 1944 as a ‘protest’. A group of young lads had been banned by the Town Hall from participating in the traditional summer parade of the village of Buñol (I can’t find out why, exactly!). They began throwing tomatoes around as a protest to the councillers who had banned them from the parade and had such a good time, they decided to do it again the following year. The idea simply ‘caught on’ and now, ironically enough, it’s the Town Hall who encourages the whole thing! Not surprising as thousands of visitors swamp the town every year! The idea behind it then is a protest against authoritarian rule, the ‘establishment’ and such like! I hope you don’t mind such a long comment. I’m following all your articles with great interest! OH really? Well, thanks for that information Marie – how interesting! Especially this year as the local council will profit out of the Festival to the tune of 200,000 euros! I’m sure it IS great fun, Dallas – I can’t help but think about all the clearing up!! I have always wanted to do/see this! Think of all that gazpacho we could make! Thanks for posting the ticket website. You’re welcome, Marie ….. yes, gazpacho heaven!! I guess crowd control is that important ? Hmmm didn’t know getting tomatoes hurled at you would be in such high demand 😉 ouch! Hopefully they are quite ripe! I think I will pass this year! But it is better than mud wrestling. Hahaha … yes, I guess so! This looks like so much fun!! i would love to be able to attend it someday…. Sauce of income, lol! Those people who paid their 10 quid to get in will be kicking themselves – they were well and truly squeezed and lathered! Hahaha …. me too, Sophia! What an experience that must be!